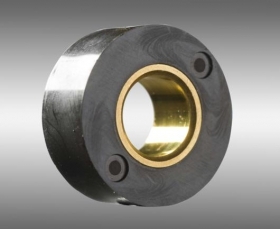 The plastic-bonded, injected magnets consist of the components of magnetic powder and thermoplastics (matrix material PA 6, PA 11, PA 12, PPS). The plastic granules and magnetic powders are compounded in twin-screw extruder and then granulated. Then by an injection molding process, the material is placed on the corresponding shape. The magnetic properties of this mold magnets are due to their lower density, however, smaller than the ones produced in the form of press tools. These magnets achieve highest form tolerances, to dispense with another molding process.In this general tolerance of ± 0.1 mm are observed.